Along with being a practical way to add lighting to highlight your landscaping, solar lights are lovely because they are economical and environmentally friendly! Spring is already here, and it’s past time to start thinking about what updates your outdoor space needs before your first cookout! Adding lighting to your deck and outdoor space is a great way to improve your home. Not only does it allow for safety from tripping and falling in the dark, but it enhances the ambiance and makes your space more usable for longer. That said, there are many, many different types of lighting you can choose from, today we’ll walk you through some ideas to get you started. One of the first places to add lighting when updating your space is your footpaths and walking areas. Not only does this help make your space more inviting, but it significantly reduces the chance of injury and accident. The last thing you want after a night of partying is to have the grillmaster trip over a chair leg and send all of the burgers flying! For a fun and functional way to add extra lighting, add a few tiki torches into the mix! Along with being a great way to add to the ambiance with soft, firelight, tiki torches can help keep bugs away. This will help you, and your guests enjoy the great outdoors in comfort. Along with being a practical way to add lighting to highlight your landscaping, solar lights are lovely because they are economical and environmentally friendly! With their low maintenance nature, you’ll be able to set them up and then forget about them. 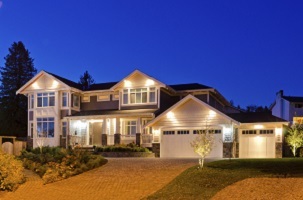 Is your home suddenly less dynamic at night? If you’re relying on one single exposed bulb above the garage to welcome guests after dark, you have some work to do. Adding more attractive lighting at your front door can make your home easier to spot and more welcoming to guests. If you still have more questions about how to best prepare your landscape or garden for spring, the trained professionals at Lehnhoff’s Supply are here to help you. Find us at 2708 Belair Road, Fallston, MD 21047 and give us a call at 410-510-7646. For tips, tricks, and to see what we have been up to, be sure to follow us on Facebook and Twitter! We serve but aren’t limited to, the following parts of Maryland: Harford County – Fallston, Forest Hill, Joppa, Edgewood, Bel Air, Churchville, Havre de Grace, Jarrettsville, Street, Aberdeen, Abingdon, and Joppatowne. This entry was posted on Friday, April 12th, 2019 at 1:44 pm. Both comments and pings are currently closed.